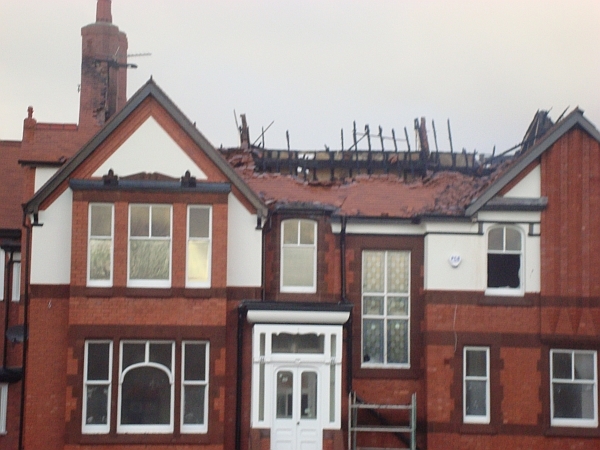 Meols Drive was closed to traffic in the early hours of Wednesday, 7th December as fire crews attended to a major fire. 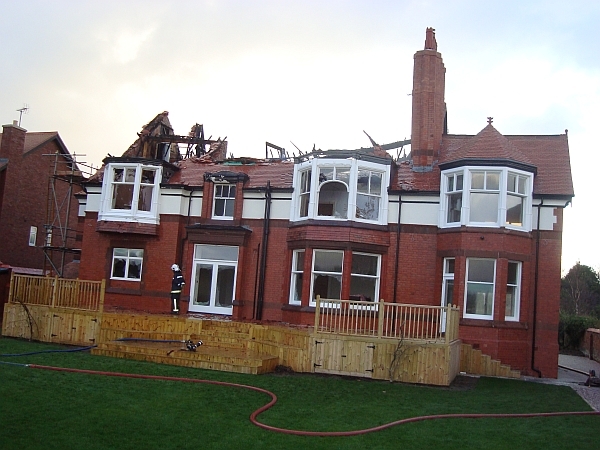 The fire broke out at Redcroft (pictured above), a significant private property that has been undergoing an extensive renovation programme. 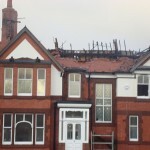 The blaze started just after 1.00am and could have been started by a lightning strike that occurred at around 1.15am. 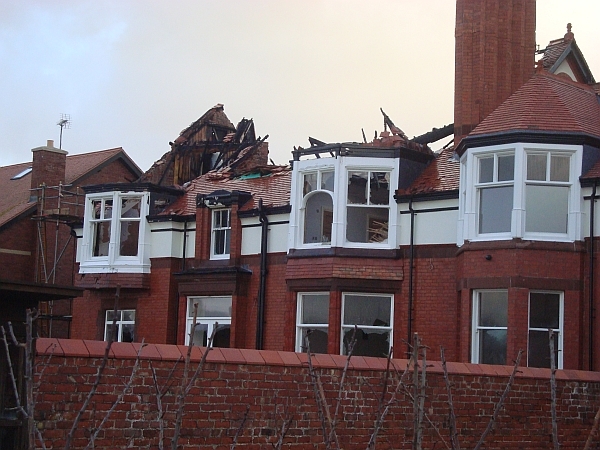 Merseyside Fire & Rescue report that the height of the fire four appliances and an aerial fire unit were involved in tackling the blaze. At 9.30am two appliances were still on scene after relief fire crews were sent to the area. 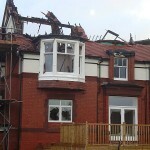 The main body of the fire was suppressed by 4.06am, with other pockets of fire further targeted by hoses. 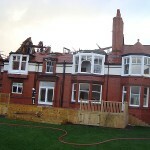 Redcroft is an Edwardian property that overlooks the 18th green of Royal Liverpool Golf Club. The property was purchased by Mr Tim Ryan after being marketed for sale in spring 2009 and was previously the home of Dr Wakely and family (source). The property is not currently occupied. 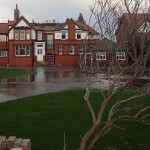 Many Hoylake residents heard the very loud thunder and lightning strike at around 1.15am. Local RNLI member Ian Davies reports that various electrical items in his home have been damaged. Strong winds have again caused some localised damage; at least one of the lampost banners on Market Street has partially come away from fixings, the Christmas lights appear to have come loose and several homes have damaged fence panels and TV aerials. 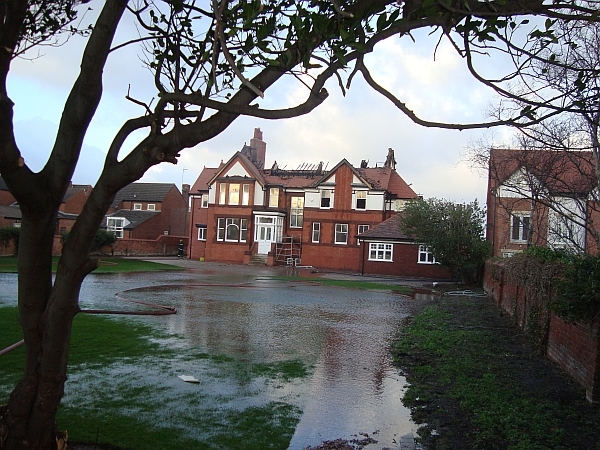 Were you affected by the lightning strike? Please leave a comment below. It was the loudest lightning / thunder I have ever heard. I was in bed on Ferndale Road and had just turned in. there were 3 peals. The first was “normal very loud thunder”, then, a minute later, the second was unbelievable. I heard our newish bedroom windows bend to near implosion. I got a strong sense of it being right above the chimney pot of our house. It was as loud as those REALLY LOUD fireworks that they banned a couple of years ago. A really sharp ‘crack’ rather than a rumble. Then the third was just like the first. This stuff doesn’t worry me normally but I was very relieved at that point. Incredible. This was all just after 1am. What a tragedy, how awful for the owners after so much hard work to bring Redcroft back to its former glory. Lets’s hope it can be fully restored again. this is so awful, i was unfortunate enough to watch the events unfold from my home diagonally opposite, the flames were enormous and large sparks, like sycamore leaves, were being sent quite a distance in the winds. from the lightning strike to chaos seemed to be just a few minutes….it is such a good thing that nobody was asleep in the house. 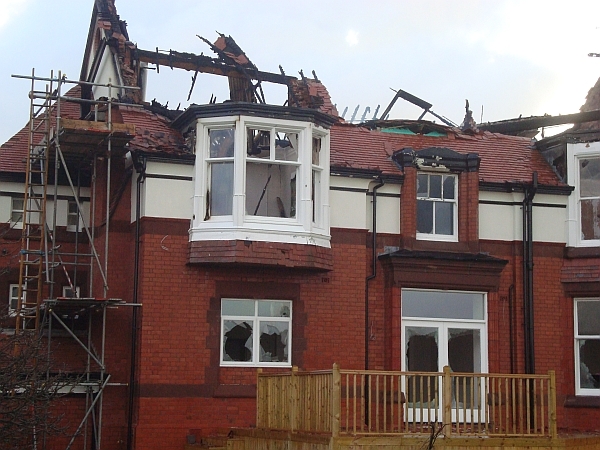 my young daughter and i have enjoyed watching the progress of the renovation of this house for months now and it must have been nearing completion as it was looking glorious…..my best wishes go out to the current owners of this once beautiful home, i truly hope it is salvagable. Whilst it is very nice to see that Network Rail is spending money on the local stations – your article on Manor Road Station accessability refers. A lot of money has been spent on my own local station in Meols but with regard to accessability, disabled access is very good if you are going on the Liverpool bound line, however, there is no accessable exit at all on the West Kirby bound side. There used to be a path leading to the main road from the platform but, so I have been given to understand, the angling club who have the sole rights to that land, got it closed off about 25 years ago and no other exit for disabled people has ever been provided. The only exit at Meols is up all the steps and over the bridge, as far as I can see. This is impossible for disabled passengers and I think that some thought should be given to this problem. Interesting account and pictures John and, yes, hope the damage can be sorted through insurance. Hats off to MFRS, an interesting job for them no doubt. There were 3 lightning discharges in the very immediate Hoylake area during the short lived storm last night , the first at approximately 0039 with the last one just under 5 minutes later. The storm moved away very rapidly towards the SSE with a few more lightning strikes as it died out. There is a good possibility that the strike which caused this damage to Redcroft was a, relatively rare, positively charged strike. These form between 5 and 10% of lightning strikes and eminate from the top of storm clouds. As they have to travel a further distance to ground they are typically 10 times more powerful and last longer than the more regular negatively charged lightning strikes, and because of this they are believed to be responsible for fires (house, forest or other) and other severe that is caused to properties by lightning. 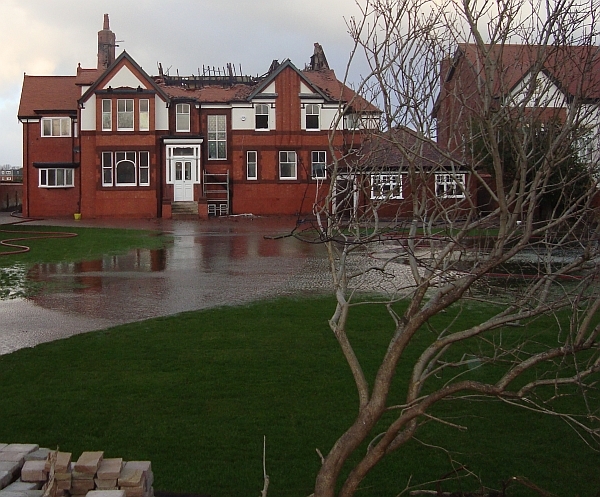 Typically, in the UK, these strikes are associated with storms which form on frontal boundaries in cold air masses running over relatively warm maritime waters during winter months – ie, the conditions we had in Hoylake last night. So if this was a positive strike, it really was bad luck for Redcroft. Having said that it was incredibly good luck that it didn’t strike an occupied property I suppose. More foul weather to follow tomorrow afternoon/evening with the main concern being potentially damaging wind gusts, maybe up to 70mph, perhaps with further thundery showers, so time to batten down the hatches ;and Friday no better with a raw and gale force NNWly with showers of rain,sleet ,hail and snow..yugghh! We have had some interesting weather in the village this year- I know of a few people who witnessed the funnel clouds and waterspouts on 26 August this year. I’ll send you an email John with a number of photographs/videos and links to other peoples’ resources – you may want to put up a slightly belated article!. The bolt of lightning woke me up in Saughall Massie! What a soul-destroying catastrophe for the owners! We’ve enjoyed watching this magnificent house getting renovated over the months, and were delighted that the property was being retained as a family home. I can only imagine how devastated they – and everybody else involved in the renovation – must be feeling after so much hard work. Like everyone else I wish the owners all the very best, and only hope that this lovely building can be restored to glory. On the face of it, this looks achievable. Has anyone heard any news in this regard? I know that a surveyor was looking at teh property yesterday. Is there any more news on Redcroft? Has the building been weatherproofed yet? 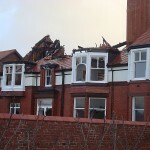 There was a similar roof fire at a Georgian town house a few yards from me in Edinburgh. It was fascinating to see how quickly the building was protected by weatherproofing the roof but I think it was about 18 months to complete the repairs and a family recently moved in. Damaged windows have been boarded over and scaffolding has been re-erected but the remains of the roof haven’t yet been covered over. 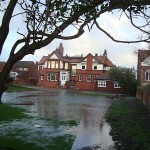 Presumably the rain that we’ve had over the last week has been inflicting more damage.